Twenty-five years ago, Connecticut-based architect César Pelli said that his new One Canada Square tower at London’s Canary Wharf was ‘England’s first skyscraper’. It wasn’t - London alone had quite a few, among them the world’s tallest cantilevered building (Seifert’s NatWest Tower, now Tower 42) and tallest medical tower (Guy’s Hospital). But at 235m high, Pelli’s 50-storey, steel-clad tower was the tallest of all, at least until 2013 and The Shard. It transformed more than the skyline - it shifted the economic geography of London and magnified the scale of commercial architecture. It is staggeringly big - London’s first million sq ft plus tower, with 114,750 sq m of office and retail space. An ultimate, outsized symbol of PM Margaret Thatcher’s go-go services-based economic revival and global neo-liberal capitalism, it now faces changing times. But it’s still standing, prospering... and adapting. London’s docks had started closing in 1967, but in 1981, Government environment minister Michael Heseltine set up a quango - the London Docklands Development Corporation (LDDC) - to lure development. The media were early movers, most famously Murdoch relocating newspapers to Wapping. Further east, Canary Wharf was a thin sliver in the echoing desolation of West India Docks, where rum and bananas had been landed. 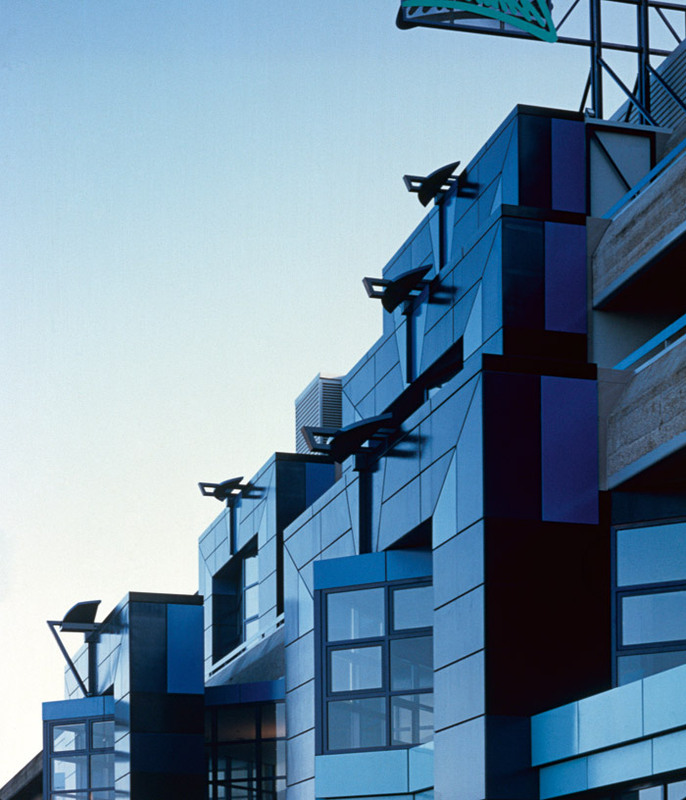 Terry Farrell adapted a warehouse for television production with his characteristic post-modernist pizzazz - abstracted birds cantlivered from deep-blue stepped facades. It opened as Limehouse Studios in 1983. The satirical puppet show Spitting Image was among the shows made there, and George Harrison and Eric Clapton recorded a concert there. But already developers had bigger ideas. The Docklands’ Enterprise Zone status offered a 10-year tax holiday, and the financial sector needed big, open, trading floors after the Big Bang deregulation, which the City’s cramped, piecemeal sites could not offer. American developer G Ware Travelstead commissioned global practice SOM to masterplan a ‘Wall Street on Water’ for Canary Wharf. Its 1985 proposal for 929,000 sq m of new offices included three towers to dwarf any in the City. When Toronto-based Olympia & York took Canary Wharf over in 1987, it pushed forward with a plan initially based around one tower - One Canada Square. 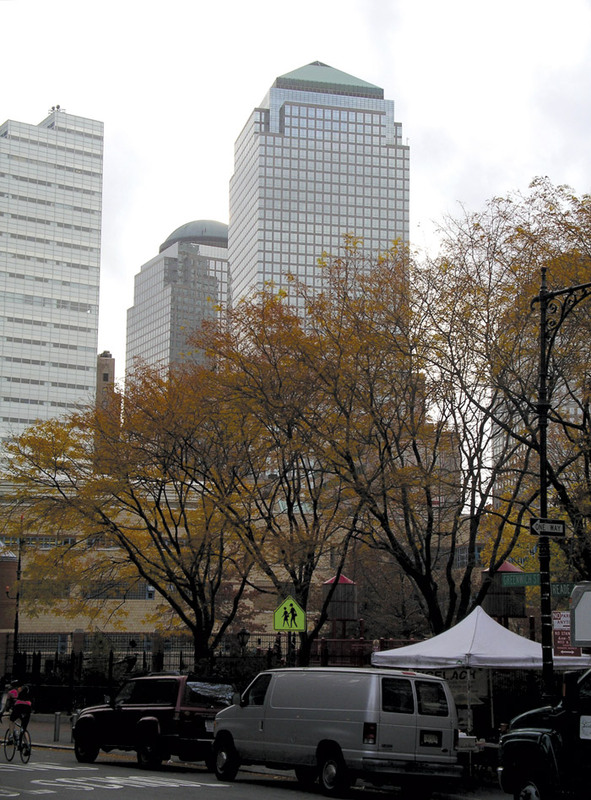 It knew what to do - in New York, Olympia & York had developed a complex called World Financial Center (now Brookfield Place) on land reclaimed from the Hudson River. There Pelli designed four towers, the tallest a 225m-high, square-plan tower with a pyramid roof, now called 200 Vasey Street. It was completed in 1985. In 1988, a huge cofferdam was built to seal construction from water. Some 222 piles were driven 23m deep and a 4m-thick concrete raft was sunk to anchor the tower and its 27,500-tonne steel framework. The Thames was alive with 300 barge-loads of construction material every month. 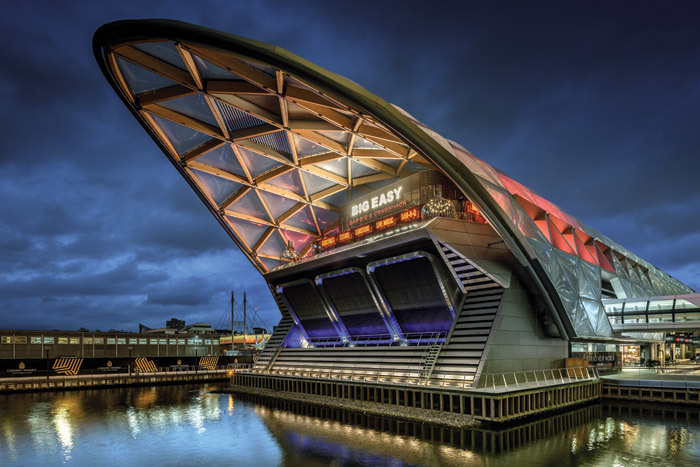 The tower rose rapidly using American fast-track construction methods, and soon its Patten Hyclad Cambric-finish stainless-steel cladding was dazzling across East London. In August 1991 the tower was open for business. It was an instant icon, more than a decade before iconic skyscrapers from the Gherkin onwards started proliferating. If London towers had been given nicknames then, One Canada Square might now be known as the Obelisk. It seems chunkier than it is, simply because high surrounding buildings obscure that ‘svelte’ form. With a grid of punched windows in solid facades rather than a glass curtain-wall envelope, it shares the solidity of pre-Miesian skyscrapers, and indeed Pelli had even initially considered stone cladding, as at 200 Vasey Street or his nearby 153m-high 40 Bank Street tower. But what makes One Canada Square very post-modern is at the top and bottom. 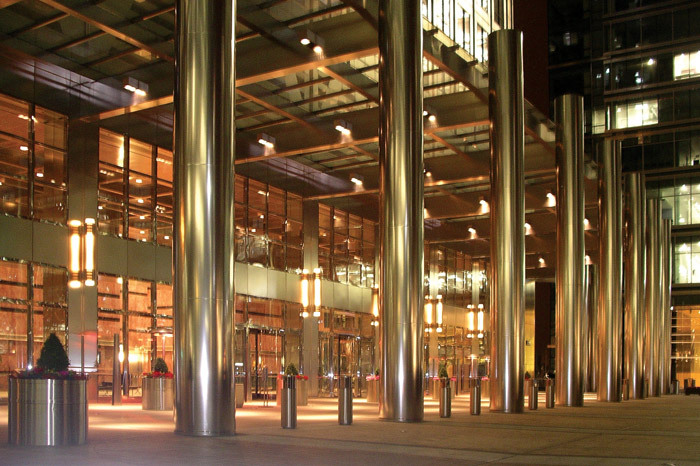 Polished metal columns that create colonnades north and south feature a jazzy, art- deco effect. Beyond them is a vast 11m-high lobby, clad with almost 8,400 sq m of deeply sumptuous polished Italian Rosso Levanto (more purple than red) and Verde Imperial Guatamalan marbles, all very po-mo. Its perimeter is public, and hosts art shows. Rather than entering a corporate reception, you feel as if you’re entering a hushed antespace of timeless power. 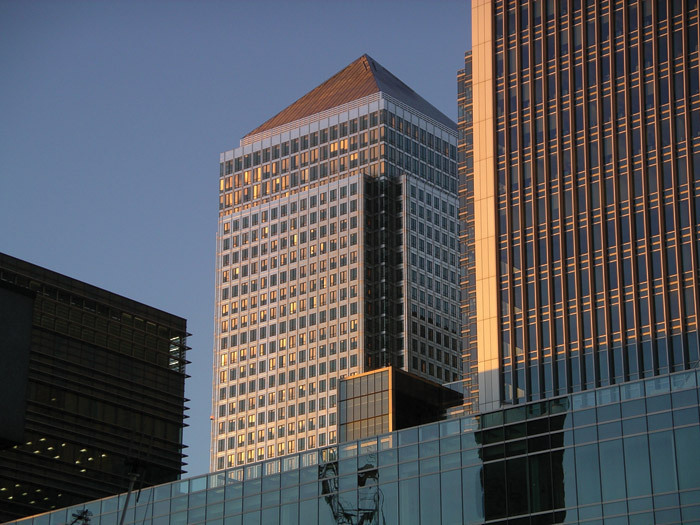 After a slow start due to a recession, One Canada Square filled up not just with financial sector tenants, but media as well - The Telegraph and The Independent were both based there in the Nineties. Others have included the London Olympics Committee, masterminding the bid for the 2012 Games. But financial services still dominate the tenant list. 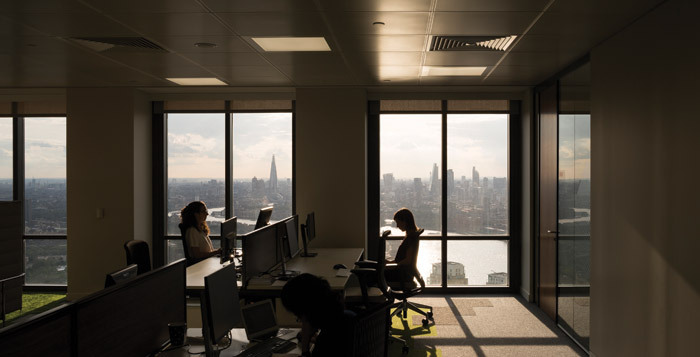 Diversifying the mix of a multitenant office reduces risk and One Canada Square is targeting new sectors, led by Level39, which hosts ‘tech accelerators’ and new tenant, University College London (see pages 149 & 152). The building’s working population has picked up from the financial crisis of 2008, from 6,600 then to 9,975 now. The building’s energy performance has improved too: landlord consumption down 30 per cent since 2007 thanks to initiatives such as installing LEDs and upgrades on HVAC and water services. The building was extended in 2009 - the Park Pavilion, a two-story glass structure designed by Pelli and Koetter Kim, replaced a few car parking spots. Four popular restaurants and a bank occupy it. The third-level roof terrace gives diners a view over Canada Square itself, and there are also rectangles of a sedum moss green roof. A skylit public colonnade separates the pavilion from the main building. 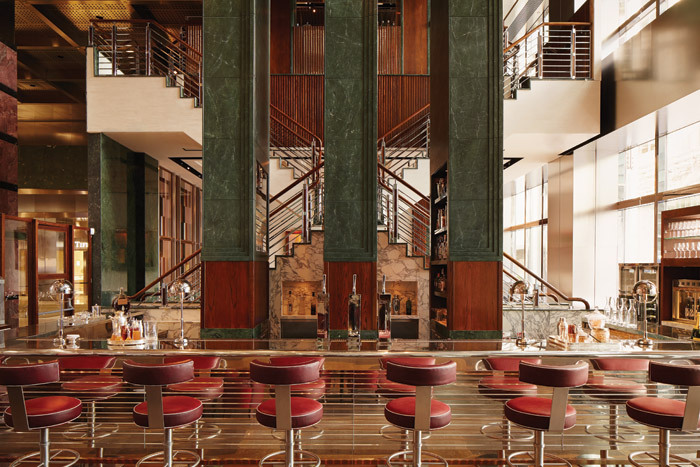 Change came to the timeless lobby in 2013, when the One Canada Square Restaurant and Bar opened in it. The David Collins Studio design manages to look simultaneously established and contemporary - it exploited the marble surfaces, introduced two crossing floating staircases, and deployed bespoke furnishings inspired by vintage cars, under steel ceilings hinting at high-tech, with chrome light fixtures. ‘We looked to the rigorous, post-industrial designs of the early Nineties and married them to a softer dining aesthetic complemented by classic brasserie details,’ sayss the studio’s creative director, Simon Rawlings. When One Canada Square opened, it was a wake-up call for a half-moribund London to reclaim its world-city status, at least commercially. Even if Brexit actually happens, that status looks secure, and the metropolis is now crowded with skyscrapers that compete with Pelli’s shiny behemoth. As for his assertion that One Canada Square was the first skyscraper in London, Pelli sticks to his guns, ‘because I believe that skyscrapers need to have clear vertical forms, aspiring to the sky. They also need to be taller than surrounding structures’. That still holds true within Canary Wharf, even with the Citicorp HQ that he also designed and Foster’s HSBC tower, both completed in 2002 and reaching 200m, and residential towers climbing even higher than them nearby. Like the neo-liberal global economy it epitomises, the tower is resilient to events. Its immutable shiny exterior reflects that. One Canada Square is set to remain a stand-out London landmark - a solid sentinel created by capitalism but referencing higher things. Looking around Level39, named after its location in One Canada Square, you often come across bowls of Smarties with spoons to scoop them up. Some 1,807kg of them were consumed here in 2015, washed down with 276,111 coffees. Smarties could well describe the people who work here - a hybrid of techies and entrepreneurs building ideas and new digital businesses. In 2012 Canary Wharf Group asked entrepreneur Eric van der Kleij to establish Level39 as an ‘accelerator space’ for the booming fintech (financial technology) and cybersecurity sectors. It provides young companies an incubator for their businesses and an ecosystem in which they can interact, internally and internationally. Now, Level39 is also growing smart-city companies, and has taken two extra floors - at levels 42 and 24, which it calls High Growth Spaces. 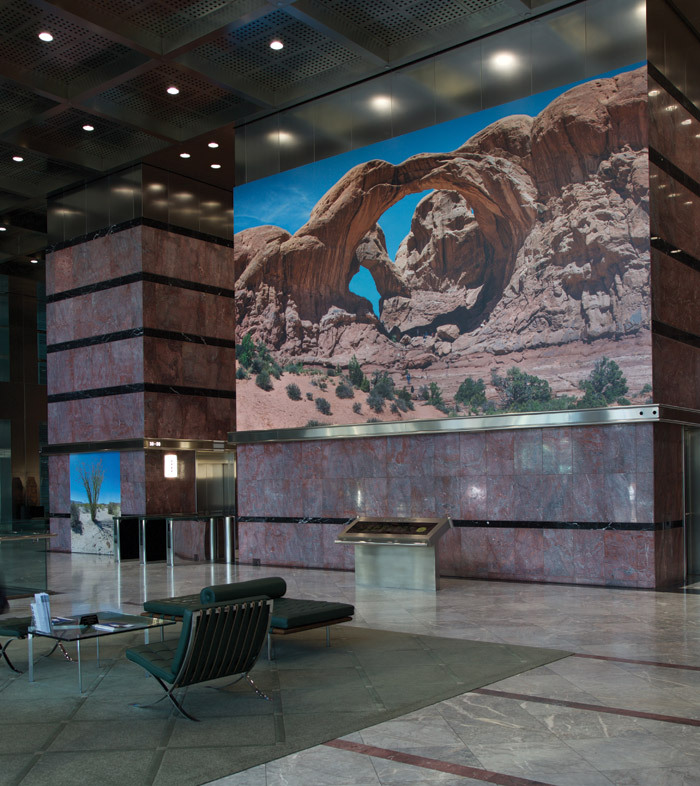 Gensler completed the interior design of Level39 itself in early 2013. 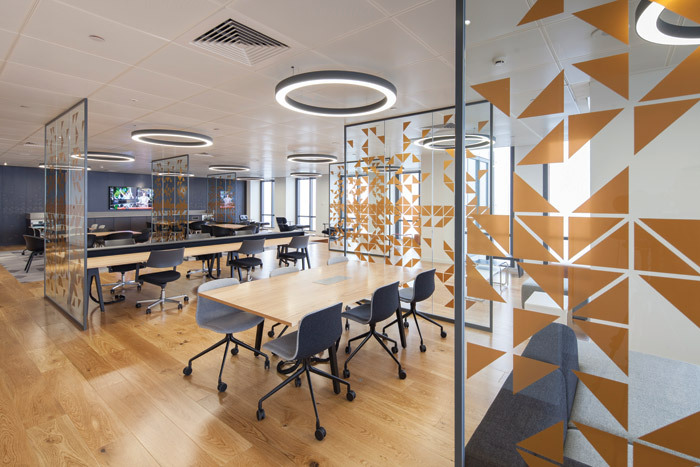 The brief was to create space that included hot-desking, fixed desks, breakout spaces, meeting rooms, kitchen and lounge, and as Level39 content manager Asif Faruque reports, it had to ‘make it look a bit like a bank’. 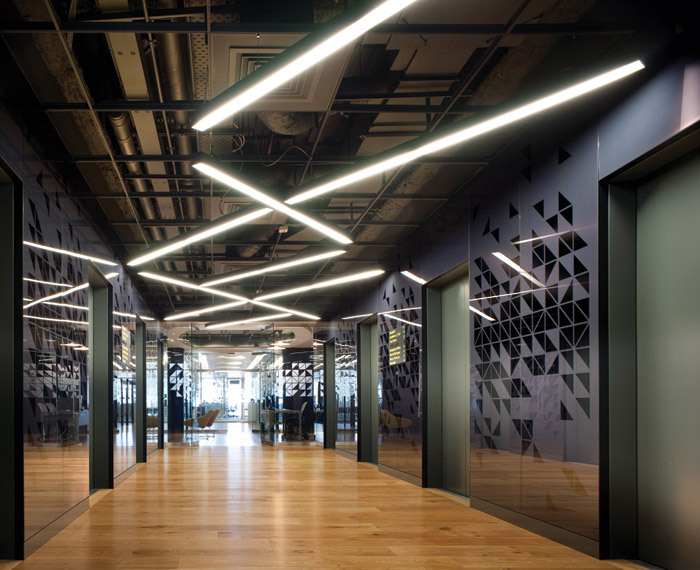 The reception space/lift lobby certainly has gravitas with its polished wood floor and black wall finish across which triangles scatter, a motif continued on glass screens around the floor. Corridors and the pantry (where a bell is rung at 3pm to announce freshly baked cookies for all) continue the wood/black aesthetic, with zig-zag ceiling lighting, but mainly there is natural light and access to views. 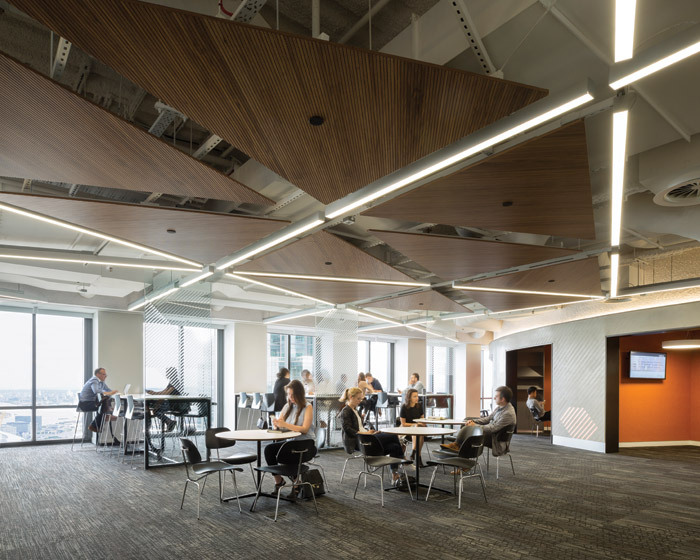 At the 250-capacity Events Space, ceilings have been opened up to increase the sense of space and expose pipes and HVAC fixtures. The floor has variety. In a quiet wood-panelled alcove, two purple sofas sit. The Club Lounge39 is a smart but unstuffy dining facility beneath rings of light hanging from a panelled ceiling. Canary Wharf is a realisation of the epic story of integrated urban high-rise development visions, starting in 1922 with Le Corbusier’s Ville Contemporaine but now blooming in the contemporary global economy. The estate also demonstrates the near-total eclipse of public-sector urban planning by commercial developers. For 25 years Canary Wharf has been the future materialising and, like a page-turner thriller, it still makes you ask, what’s next? Le Corbusier’s totalitarian vision of lined-up 60-storey uniform blocks is a long way from Canary Wharf where, as George Iacobescu, chairman of Canary Wharf Group (CWG), says: ‘We ask [the tenants] what their ideal environment looks like and what their needs are, and we put them together and create a building that has everything in it that they want’. The resulting commercial city-in-a-city owes more to John D Rockefeller Jnr than Corbusier - in the Thirties he commissioned the brilliant Raymond Hood to mastermind the Rockefeller Center, 14 art-deco blocks in Midtown Manhattan, all clustering around a signature tower, the 266m-high RCA Building. It wasn’t just offices - it offered shopping, rich public realm, art and entertainment. Exactly as Canary Wharf does. In Europe, only Paris’ La Defense is comparable in scale and diversity of offering, but unlike CWG, its management body EPAD is state-appointed. When it opened in 1991, Canary Wharf’s planning and architecture (bar UK practice Troughton McAslan’s 25 North Colonnade) were American. Beside the tower were a handful of vast, slick, marble-clad blocks (and one in neoclassical masonry) offering big trading floors. Canary Wharf has expanded and evolved big time since then. Now there are 37 office buildings, more than 300 food and drink outlets, five shopping malls, venues and parks... and the UK’s largest concentration of green roofs. In 1999, when the vast Norman Foster-designed cave of the Jubilee Line station plugged Canary Wharf into the Tube, the working population was 25,000; now it is 115,000. 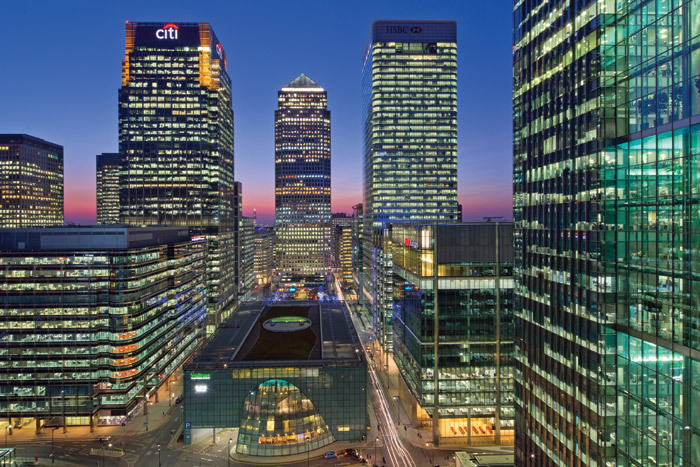 Canary Wharf lured banks’ headquarters, including HSBC and Barclays. The tenant base is still 56 per cent financial services, making it a bigger financial hub than Frankfurt. But tenants are diversifying, as Level39 shows. Nowadays, new developments are packaged with a lifestyle dimension; Canary Wharf is no exception. Two big changes are already underway. The estate is expanding eastwards into Wood Wharf, which Canary Wharf acquired in 2012. Thirty buildings are planned there. Secondly, Canary Wharf is bringing apartment blocks into the mix. No wonder - new high-rise residential development has boomed all around it. The Stanton Williams-designed 10 Park Drive, dominated by a boxy slab, is already being marketed, but others are breaking out of the rectilinear boxiness that characterises the estate. To the west, the 220m-high, diagrid-faced, folded form of the Newfoundland Tower by Horden Cherry Lee has begun construction. A 205m-high cylindrical Herzog and de Meuron tower will join 10 Park Drive in Wood Wharf. One of Canary Wharf’s biggest successes has been in transport. It’s a post-car quarter, only five per cent arrive for work that way. The arrival of the Elizabeth Line (formerly known as Crossrail) in 2018 will enable it to stay that way. Foster + Partners’ extraordinary 310m-long cylindrical Crossrail Place, incorporating restaurants and an enclosed roof garden, opened last year, and station boxes beneath it already await the new Elizabeth trains. Being in an outpost some five miles away as the crow flies from the main university campus is usually not such a big deal for the students. But in the case of University College London, it’s the move being taken to make their School of Management ‘world class’ and give it an edge in attracting the brightest students from around the world. The School of Management - UCL’s business school - has taken up residence on the entire 38th floor of César Pelli’s One Canada Square and it opens for, ahem, business this month. In this ever-more competitive world, the director of the School of Management, Bert De Reyck, says putting students in the very heart of one of the world’s leading financial districts gives it ‘a unique competitive advantage’ with the likes of Oxbridge and beyond. The aim is to forge links and programmes with institutions in the area and with Europe’s largest fintech accelerator, Level39, which, you’ll be surprised to hear, is on the floor above. 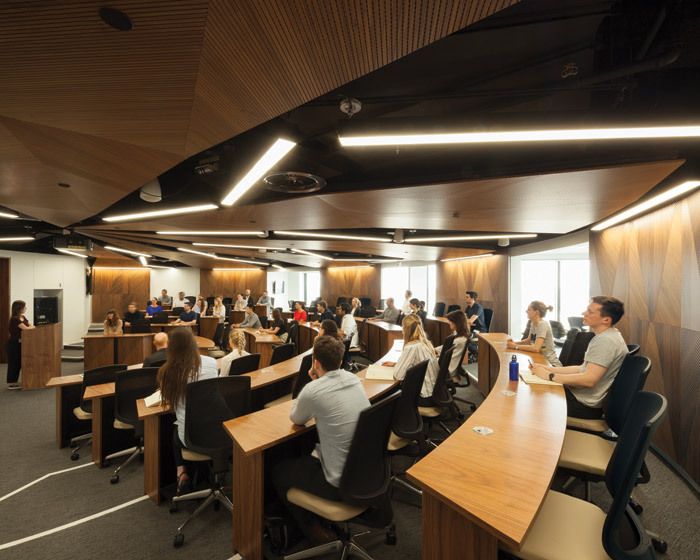 From this month, all of the School of Management’s postgraduate programmes will be taught at Canary Wharf, with undergraduate degrees remaining at its Bloomsbury campus. The focus will be on innovation, technology, entrepreneurship and analytics, and the new space - designed by London architecture practice Levitt Bernstein — aims to reflect and foster this. Anchoring the interior are two state-of-the-art lecture theatres. These are ‘Harvard style’, which essentially means an intimate, semi-circular design that puts all students near the lecturer and hence closely engaged. It’s also less formal than traditional lecture theatres and much of what Levitt Bernstein has done with the rest of the floorplate is about informality and breaking down traditional barriers to encourage openness, cooperation and those random meetings that can lead to the next big thing. 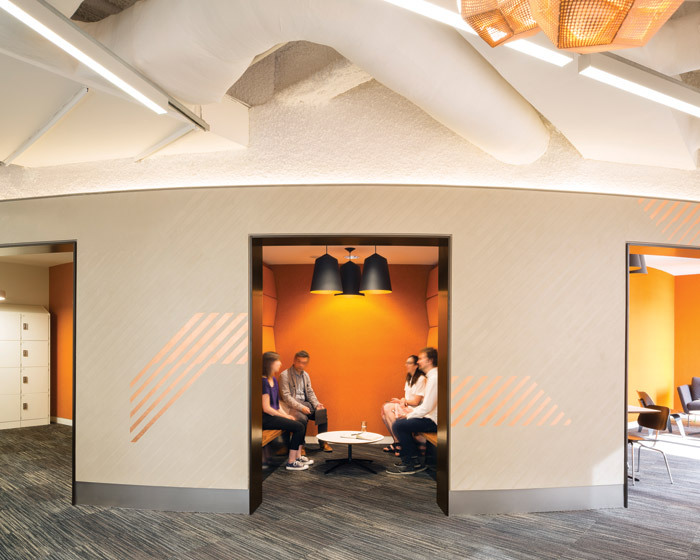 ‘By using broken geometries across the whole floorplate we’ve created informal spaces and shared breakout areas that allow for serendipitous meetings between students and faculty, with the aim of sparking unexpected conversations and shared creative thinking,’ says Levitt Bernstein managing director, Matthew Goulcher. The space uses texture and colour, rather than walls, to delineate six areas of the school’s operation, that are now called villages, and there is also an open ‘hub’ space just beyond reception that allows for students to interact in various ways from open tables to sound-insulated booths. There are also a number of glassed offices for lecturers (who are notoriously difficult to get into open spaces), but these are all away from the windows - no corner offices here. And leaving nothing to chance and making sure the new environment was also bang on brand was consultancy Studio Blackburn, brought in to leverage the school’s identity throughout the floor. It is undoubtedly a world-class space and probably unlike any that most graduates reading this will have experienced. Keeping the students focused may well end up being the main issue, with the incredible views that are offered in the building, from just about everywhere except the lecture theatre.